Well, I have been feverishly painting my kitchen cabinets these last three days, hoping that I’d have at least the wall of cabinets finished so that I could have a big “taaaa daaaa” today and show you how my new colors look in the kitchen, but I fell short of that goal. I got everything painted except for the two largest lower cabinet doors, which still need the second coat of paint on the fronts, and the inside of the middle upper cabinets that have the glass doors. Those also still need a second coat of paint. And as far as the others go, by late last night they were still too tacky to handle in order to install them. So I’ll give them another day to dry, get them installed this weekend, and show you how it looks on Monday. And by the way, it looks awesome!!! As much as I loved the green cabinets, I think I like the new colors about ten times more. The Gentleman’s Gray (which is a really dark blue) has to be one of the most beautiful colors I’ve ever seen, and the Revere Pewter is the perfect complement. This first one would be my top choice if it weren’t so expensive. 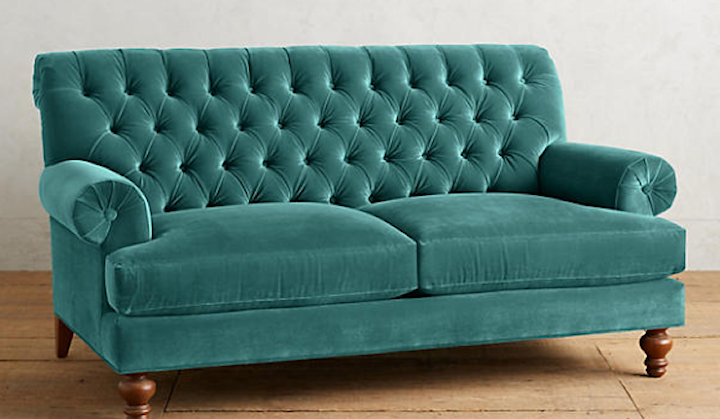 I’m willing to splurge on a sofa, because in my entire adult life, I’ve only owned two brand new sofas, and both of have been Ashley brand. I’ve vowed never to buy upholstered Ashley furniture again (case goods might be fine), and I do want an actual quality piece of new furniture. But still, $3500 for a sofa is a bit hard for me to swallow. It’s my absolute favorite, though. Anthropologie actually has the largest selection of velvet sofas that I’ve found. Their color selection is great, too. And their prices are more within the price range I’m looking for. I could see myself paying around $2000-$2500 for a sofa, and that’s a big splurge for me. World Market probably isn’t the quality I’m looking for in my living room (although for a bedroom or office it would be perfect), but I really love the color on this one. Anything that has a hint of purple, or that is actualy in the purple/lavender range, would be a big step for me. It hasn’t been long now that I’ve actually started liking purples and blues with hints of purple. Another gamble for me, but wow! I love this color. What I’m not crazy about is the slub velvet. I prefer the smooth velvet. This color is a bit of a departure for me. It’s somewhere in that blue-green range, and I generally prefer my dark blue-greens to be more on the blue side. This one is definitely way more on the green side with just a touch of blue, but I think it’s a really pretty and rich looking color. This is more along the lines of the dark blue-greens I tend towards — a very blue-leaning dark teal. And another option in the purple family, which also has the slub velvet. I think this color is so pretty, and I really love that it has one long seat cushion rather than two or three cushions. I think this blue is so pretty, but I’m not so sure about the silver nailhead trim. And I find this color to be absolutely gorgeous. It reminds me of my kitchen cabinet color from the condo. I do wish it came in a smooth velvet instead of the slub velvet, though. And yet another dark-ish blue-green that’s more on the green side. I seem to have picked out quite a few of these. I don’t know if it’s my subconscious steering me in this direction, or if it’s just a matter of availability. I think there are just more green-leaning blue-greens out there right now. I honestly don’t think I could do a dark purple, but I wanted to add it anyway. 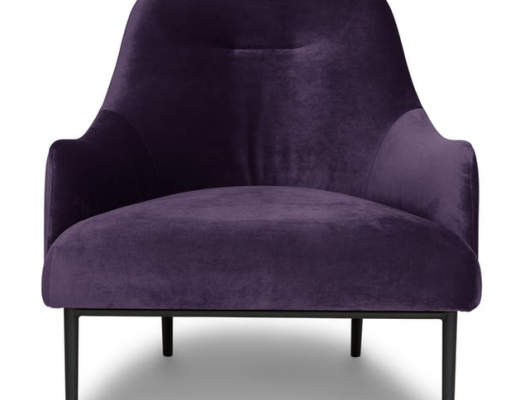 I can see using dark purple accents in my rooms in small doses, but I think it’s still too much for a large piece of furniture. Purples are definitely growing on me, though. THIS.IS.GORGEOUS!!! This might be the most perfect blue-green color ever. Even though it’s greener than my norm, this has to be one of the most beautiful colors I’ve ever seen. It’s just a touch brighter and bluer than the Anthropologie Velvet Fan Pleat Settee above, but that slight change makes all the difference in the world. But unfortunately, it’s way out of that price range that I feel comfortable with. And finally, one more emerald sofa. I love the tufting, but I’m less excited about the rolled arms and rolled back. So that’s my “Round 1” of velvet sofa searches that I think would work in my living room. I really don’t think I can make a final decision until (1) my kitchen cabinets are completely painted, and (2) my breakfast room grasscloth wallpaper arrives so I can see how it’ll look from the living room. That might have a big influence on my final decision. But in the meantime, I’m going to start ordering fabric swatches from any of these places that have them. I know Anthropologie will send fabric swatches, and hopefully others will also. I’d have a very hard time purchasing a sofa without seeing the fabric in my living room first. And I’ll leave you with this picture that just made me smile. As I was looking for velvet sofa inspiration on Houzz, I came across this sofa and had one of those “Oh, wow! !” moments. That color is beautiful, and I love the contrast welt cord. I Finally Started Building My Fireplace! Kristi, Where Is Your Family Room? Are these styles going to be comfortable to sit on? They are beautiful but comfortable???? Yes, agree with Elizabeth, they are all beautiful but if I was going to spend that much money I would make sure it was comfortable for sure. Nothing against these companies mentioned but I would not purchase a sofa from, sorry. I’m 5 feet tall. I’ve never sat on a comfortable sofa in my life. 🙂 I make do. I’m 5’2″, and I’ve sat on comfortable sofas. I’d never buy either a sofa or a chair without sitting on it. Even if you’re not comfortable, I’m sure you want your guests to be. I love the look of tufts, but (1) I don’t find them comfortable, and (2) they’re not fun to vacuum; dust loves to settle in them. It’s especially important to test the comfort of sofas with perfectly straight backs. If I were spending four figures on a sofa, I think I’d invest that much money in the one that will be used daily rather than used occasionally. So few people actually use a formal living room nowadays. I had a velvet sofa for over 20 years, and YES, very comfortable!!!!! Velvet also has a comforting quality to it. This is exactly what I was thinking “What about comfort”? To me it’s the very first criterion – and you know what? Every single guest I had has commented on how comfortable my couches are (sometimes adding they could stay over forever)! I only get a few guests and I actually want them to be here (no “must-have” visitors, only friends), so I like to really enjoy their company for a while when they come – and you really, really can’t do that if after an hour all you want to do is get up, desperately! I missed that! Thank you! Good stuff:) They are all beautiful!!! Is velvet durable? With those prices, I would want to make sure it would look good two years down the road. And could you buy a sofa online without sitting on it first? I would be so afraid that it wouldn’t be comfortable. Yes, velvet is very durable. I had two velvet couches that have lasted over 30 years. I finally gave them away and other than one leg breaking off during a move they still looked fantastic. Real velvet, not the imitation stuff, is very durable making them a very good investment, so make sure you love it and the color. Velvet is a classic. Have you checked out Interior Define? They have a lot of sofa options and offer 8 color choices in velvet. There is a company called Home Decorators Collection, that has a great online site & catalogs & have a partnership with Home Depot. They have custom sofas with some velvets. This is a great company that I have ordered from. The quality is good and the prices are reasonable. I also personally have a sectional from a company called Norwalk Furniture. They are expensive, but the pieces are MADE IN THE USA ,in Ohio! Best thing about Norwalk is the story of community and perseverance. Norwalk was going under in the recession & going to close up, the people in the community pooled their money together to save this company. It is in business today because of people in the community that couldn’t bear the thought of yet another factory going under in the area. I would recommend this brand of furniture to anyone. I have personally seen pictures of the factory and people there, as my local dealer has been there to visit. He said the people are wonderful & take great pride in their work. And I can say I love my sectional and can’t see myself getting rid of it in 10 or 20 years. People compliment me on it every time they see it. Have you looked at sofa options from Room and Board? Everything is made in America, and you can get any of their sofas made in any of the fabrics they offer, check out their custom tab. http://www.roomandboard.com/catalog/custom/sofas They have 44 velvet options. We have two of their sofas/loveseats and absolutely love them, another one of our friends has had theirs for going on 10 years now and it’s still going strong. I feel like they really hit a sweet spot in the market between quality and price. They also offer quite a few size options for each of their styles. I could totally see the Watson, Seaton, Percy, Lacalester or Hutton working for you design wise. I hear the same about Room and Board, good company. PS- We have the “vance” velvet fabric on our loveseat. We have 3 cats and have had it for 7 years and it’s still going strong. It’s had some accidents on it and taken some serious abuse. We’ve throw it in the washer (all the covers are removable BTW) and it comes out looking remarkably great. I’m going to be my usual “let’s talk about function for a moment” self and ask whether it makes sense to splurge on your formal living room sofa or whether you might be okay with a less expensive one. 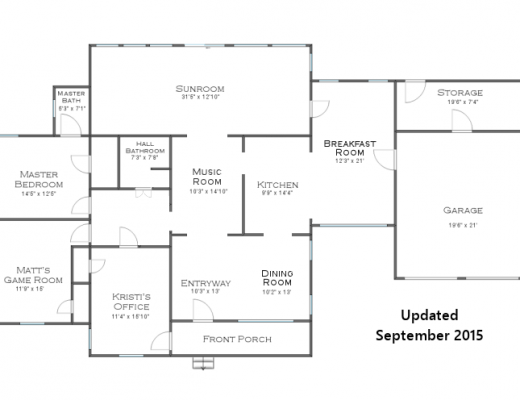 My thought is this… Once you build the family room in place of the sun room, aren’t you more likely to do most of your sitting in that room? Will you even have a TV in the front living room? I say this not to dissuade you from anything, but to say maybe you don’t have to limit yourself to high-quality furniture for this room. Maybe this is one place where you can get away with cheaper stuff since it won’t get heavy wear and tear and then save your splurge money for a nice comfy set for the family room. FWIW, my parents had a HUGE formal living room that we never used because we had a nice family room. They bought the cheapest set they could find for the living room and a pricier comfortable set with recliners and whatnot for the family room. To this day, the well-made recliner set is still in use (at my sister’s house) and the cheapy set is in the formal living room and only gets sat-on at Christmas Time. Aside from some sun fading, it still looks new. That’s actually a really good point. I’ll definitely want a quality sofa in the family room later on, so I could probably get away with doing a much cheaper sofa in the living room. That was my thought when you mentioned maybe wanting higher quality than World Market or something. Your original reason for changing it from a living room to a dining room was that you didn’t see it being used much as a living room since you will have the breakfast room, eventually the sunroom/family room, and have said that a lot of times you guys hang out in your bedroom if you are pulling up a tv show on your laptops or something. If this isn’t going to be a sofa that gets sat on daily, you probably could get by with something of World Market quality if it had the LOOK that you love. My in-laws have a formal living room at their entry way (very similar to yours) and one of their biggest regrets was splurging on high-quality furniture in that room, since it gets sat on maybe 3 times a year. My husband and I have been married for 10 years, and I can count on one hand the number of times we have ever actually sat down in that room. Oh, and I like the tufted ones, also. Not for me, but they’re very YOU. And I feel like the straight ones might wrinkle or bulge over time whereas the tufting keeps things neater and tidy. This is the same I thought Justin, when I looked and fell in love with the teal sofa from World Market. It’s about $699 and you get a 25% discount (at least you do today, lol). I really prefer the ones with some tufting. And yes I’m sure once the grass cloth how’s up it will help so much with the decision making. Even though I am only 5’2″ tall I still prefer a sofa that is pretty deep. The better to sit with my legs up on the sofa to the side and more comfortable for that occasional nap. I had a velvet sofa and the velvet was very durable and stain resistant. If I can offer some advice, I’d say stay away from tufts, especially on the seats. They are not comfortable and also have a certain stiff look about them so they don’t even look comfortable. Also, avoid getting a two cushion sofa because it only seats two people (like a love seat) because no one will want to sit in the middle on the crack between the two cushions. Also, if you choose a sofa with only one bottom cushion, be sure to sit down on one end of the sofa to be sure the other end doesn’t awkwardly pop up. Just a thought…in my experience low back sofas are not comfortable. Agree with the comments/idea to invest your money where your use is and let the “formal” areas (little use) be less expensive. Seems more practical in the long run. Loved the nail head couch and the high back green one! Such fun to be looking. Look mid century modern and their prices are good! Here’s another one, but it’s pricey too. I’m not sure I could buy a sofa online without being able to test its comfort first. I love the blue-green color of that one from King’s Lane too. One of my favorite colors in the world. I’m not a velvet fan but more power to you. 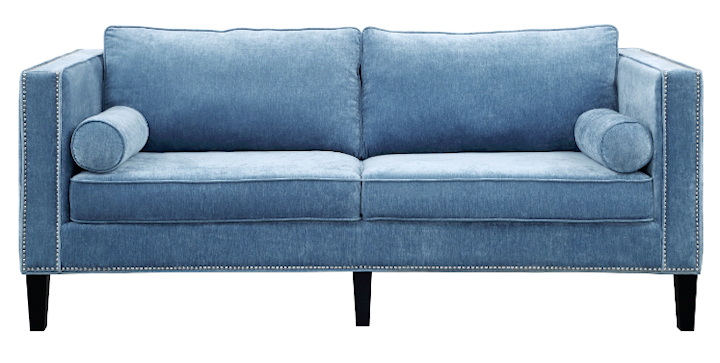 I did like the color and style of the Cooper Blue Sofa from Overstock and think it looks more like your style but I might be a bit off-base here. Good quality is nice but comfort would be my first priority. Those are some beautiful sofa options. I’ve only purchased 2 new sofas in my life too, with the last one having 2 seat cushions. I really love the look of 2 seat cushioned sofa but having lived with this sofa now for oh, about 14 years, I can say that I wouldn’t opt for that feature again. That’s because where the 2 cushions meet is really not a seat at all; no one ever wants to sit on/in “the crack”. So my 3-person sofa is really a 2-person sofa that takes up the space of a 3-person sofa. And it’s a FlexSteel with chenille that is wearing like iron, so I think I’m stuck with it for another 14 years, at least! Have you thought about upholstering the sofa yourself? I bought a small loveseat off Craigslist two years ago and reupholstered it myself in a blue velvet. In fact, some of the couches you posted above look similar in shape to the couch you painted white. I would actually prefer that, but my Craigslist never has anything good. It’s mostly junk. There is a consignment store here that I can check. That’s definitely an option. I have a 27-year old sofa from a company called Expressions (now out of business) where you specified the frame, cushion style and fabric, and they custom built it. When I had it recovered after fifteen years, the upholsterer told me never to get rid of it. It was solid wood and built to last. He said the stuff they sell today rarely meets that level of quality. Have you thought of reupholstering or getting the velvet slip covers for the high-quality sofa you found and painted? The frame and arms can be altered to what you like. The fabric would be exactly what you want. I looked at the Uran Outfitters sofa a both and both of the reviews were one star due to fabric quality and plastic, not wood, legs. Investing in reupholstering sounds like a better approach. I’m hoping all of that can be used in my office. Having once lived in AZ for many years I concluded that chenille is good…velvet is not. The amount of exposed skin and attendant skin oils (short pants and no sleeves) requires a monthly cleaning of certain areas. I love the look…but, no. I have some thoughts on color, as someone whose favorite colors to decorate with are teal and aqua and have been through exactly what you are going through right now. I have some microfiber aqua chairs that I have created color schemes around several times– a few hits but several misses. In thinking about the darker/richer teals and aquas: since you can now see into your kitchen from your living room and the sofa will be the biggest item of color in your living room, do you think it would look too matchy-matchy to have a darker teal/aqua sofa with your teal cabinets? With the teal being such prominent color in your kitchen, and given your love of color, I would lean more towards using darker teals as accent colors in the living room rather than having it as the focal color in two adjacent rooms. The lighter aquas would be beautiful, though, in my opinion. Lastly, are you keeping the black and white curtains you made for the room? Some of the more muted color sofas would look amazing when thinking of the backdrop of the muted neutral upper cabinet color that you will see in the kitchen. BUT, any time in the past that you have done a muted color with bright white, you have always ended up unhappy with the result (I’m particularly thinking of your bathroom). I have a hard time picturing some of the more muted color choices against the high-contrast, sharp, bold black and white striped curtains. I’ll probably end up using the black and white curtains in my office, so those weren’t a consideration for me when planning my living room and entryway. Oh, that last color – WOW! I would love a velvet sofa, but I have a slob for a husband, and grandkids that still climb on the furniture with their shoes on. I would go with a more neutral color and put the color elsewhere. Cheaper to paint and cover pillows than reupholster a sofa. I was stuck with a blue sofa for years! Paid too much for it so I couldn’t redo or replace. Learned my lesson. ahh but Kristi can reupholster it herself so can afford to indulge her personal taste : ) Owning an air compressor and staple gun is so freeing! These are all gorgeous sofas and all of the jewel tones get my vote. I just seem to remember that you don’t consider yourself or your style to be particularly formal, and yet virtually all of these sofa styles are very formal. The tufted ones look like they belong in a Victorian house with cupolas. I can’t wait to see your kitchen cabinets. I want to see how the revere pewter turned out. I’m figuring out colors for my cabinets as well. Actually changing all the wall colors too ,in the whole house. After you mentioned the revere pewter, I remembered my daughter saying, three years ago, that their realtor told them about a color that was super popular. Last weekend we traveled to see them for her birthday and I asked her what color she used on her walls. Yup, revere pewter! It looks awesome in their home. However, it looks different in every room in different light. Like you said, light kakhi. I’m so nervous about the green undertones. 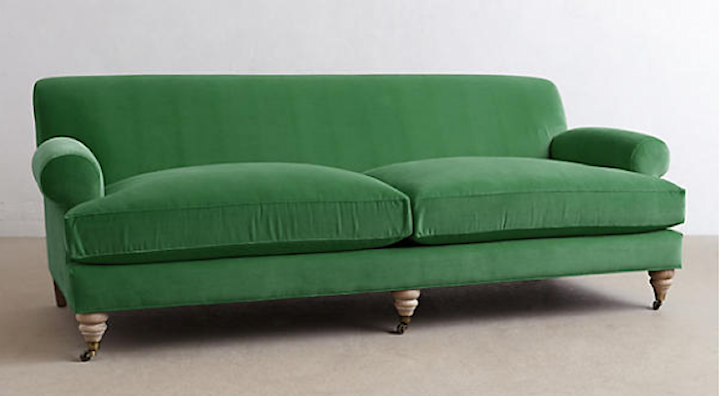 I really like the first sofa – the Adler green sofa. The World Market sofa and All Modern sofa look really similar. That must be the newest trend in sofas and it is really attractive. Its kind of like a private space with the high sides which create some privacy. Hate the “slub velvet” from Anthropologie. Looks like the sofas come from a flea market. Coco Velvet from One Kings Lane looks uncomfortable and too feminine. 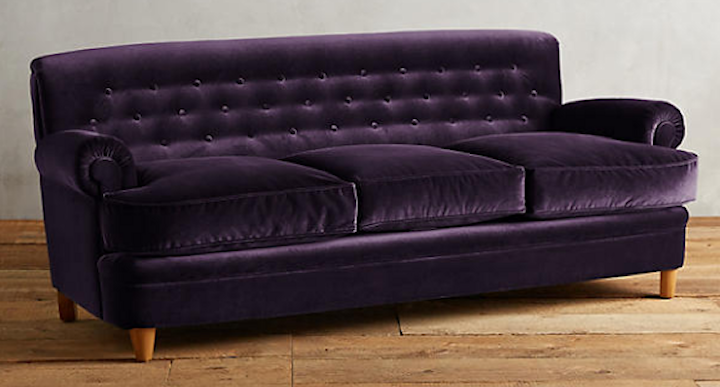 I do like the eggplant color of the Kimmeridge sofa from Anthropologie. So here’s a crazy idea… your favorite Jonathan Adler Lampert sofa has straight lines with a couple simple cushions. Considering how well you were able to do the built from scratch winged host chairs for the old dining room, a rectangular couch would be very doable for you. Regardless, your blog is a great inspiration; I’ve picked up an old sleigh bed in need of reupholstering as my first upholstery project, and feel confident about it because of all of your detailed instructional projects. I’ve also referenced your roman shade and pinch-pleat curtain instructions to create draperies for my house. Thank you! This was my thought exactly… I’ve been reading through the comments to see if anyone else had suggested this. I think a custom build is totally in your skill set, Kristi. Wether or not you WANT to do a scratch build is another thing! I agree with Cathy about neutral colors for big pieces with favorite colors on walls, in drapes, pillows, throws and and a rug to anchor the room. I have neutral with a chevron pattern in my living room and neutral in leather in our family room. We have four little dogs who consider the family room their space. LOL. The leather is easy to clean, and I wanted “beige” or light gray so I’d be conscientious about cleaning it:) I use punches of teal (including 2 chairs in Sunbrella’s deep sea dupione texture since it’s a southern exposure room) and lime green, in the family room and adjacent breakfast nook. Use same accents and even a little rust, muted orange in living room due to wallpaper I haven’t changed in the adjacent dining room. I’m planning grasscloth in my dining room which has a feature wall that extends into living room. I love wingback chairs with straight legs and armrests that are unique, so I frequented Craigslist and eventually found four Drexel chairs from different sources. My two in living room were a splurge with designer fabric. A friend recently redid her living room with four gorgeous deep, lounge chairs in velvet and a round coffee table. I wish I’d thought of that! But I’d also have a “sofa” table somewhere with a couple of ottomans or a round ottoman with the chairs and a couple of small side tables. Our kitchen needs remodeling. You’ve inspired me with your choice of cabinet colors. I think something similar would look awesome with my color scheme that is similar to yours. I admire your ability to tackle anything, and to change colors or designs when they’re not quite what you envisioned. Can’t wait to see the kitchen cabinets! I love the slubbled velvet. Thanks for doing the searching. I want a velvet sofa, but can’t be bothered searching for one. I don’t know how comfortable your first choice would be. I do like your second choice. I also agree about buying online verses trying them out. My living room sofa was a floor sample from a good furniture store. It has always been very comfortable. I bought a off white basic canvas slipcovered sofa (actually a sofa bed) on line from someplace like Wayfair. I just wanted it for a sofa in the sitting room outside our bedroom. It was about $1000. and is not comfortable at all. I don’t think it seats deep enough for me. Maybe for a shorter person it would work. I don’t really see me taking it to a new home unless I have to. Oh my goodness, Kristi! I forgot how much I loved a pretty teal. This one…. 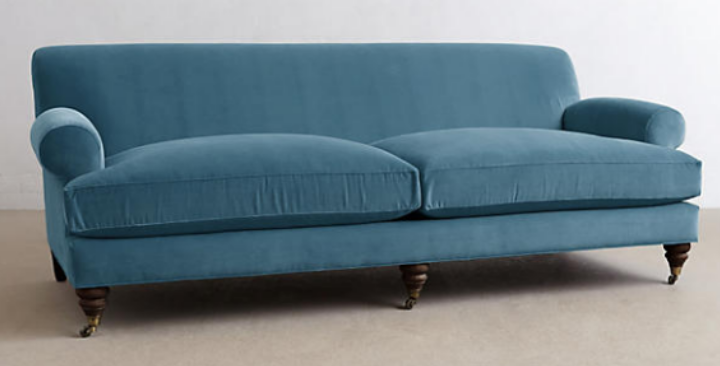 Velvet Fan Pleat Settee in Teal from Anthropologie totally caught my eye. What a lovely design and in that color… to me it just says, “Come sit awhile!” I had a gorgeous long teal wool dress coat when I was in high school and absolutely loved it. Back then, I was actually quite disappointed when teal when out of vogue. Enjoy your hunt. You have picked some beauties for sure. One thing you might want to consider in buying a sofa is the number of cushions. When buying my last one, the dealer reommened either one or three cushions. The reason being that if three people are sitting on the sofa the person in the middle is in the least comfortable spot or if one person sets in the center, the ends of the cushions may bump up. So I want with three, but I really love the look of the sofas with the single long cushion. I also love the blue green ones you are showing. I noticed most of these are tufted and I know you have cats. Would the cats try to chew on the buttons. I know mine would which prevented me from getting a tufted one even though I found one I fell in love with and we all thought was comfortable. I have microvelvet now. Love love love it. Easy to keep clean, mine is a very light color and cat hair is easy to get off. Wasn’t as easy from real velvet. What about reupholstering a sofa in a performance velvet? Then you can custom pick your color. You don’t have to do the work but have it done for you. 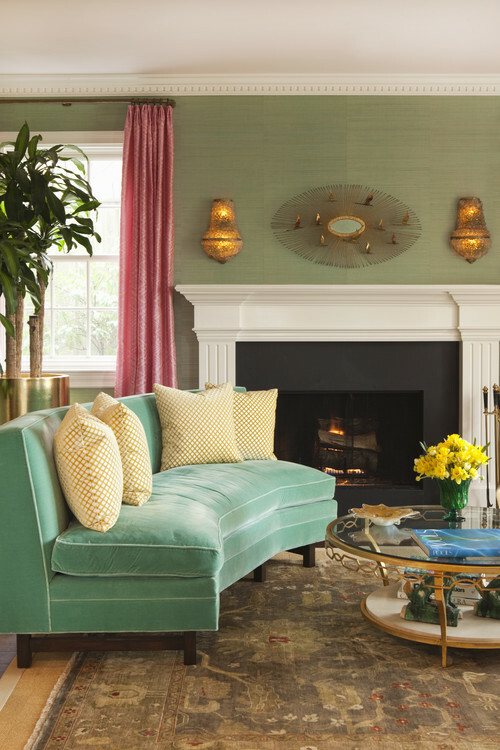 Love the tufted sofa in teal…I so want to do our guest bathroom in grass cloth. Do you have a favorite site you go to for it? I got to Sherwin Williams (the actual store) and look through their wallpaper books. The one here in Waco has about four or five different grasscloth books. Why would you never buy upholstered Ashley furniture again? I find the quality of their upholstered furniture to be very poor. Thanks – that’s good to know! Twenty years ago I bought my first new sofa by Harden.. It was 8 way hand tied spring and it is just now needing to be reupholstered……It cost me 1500 dollars with a budget chenille fabric that has worn like iron. I am planning on reuphpolstering it this years and having the springs retied. In a sofa I really think you get what you pay for. Just saying that I do not think the sofa for 3500 is all that bad if you want it for 20 years before you redo it. I would be very care ful with Anthropologie furnishings……..same with RH. Look into Thomasville, Harden, Sherrill, Drexel Heritage. Or look for something from an estate sale and have it covered. I wish I could share pix of my friend’s two velvet sofas! She got one for $100 and snagged the other at Goodwill for $18.00 on 1/2 price day! I keep running into a peacock teal sofa at pottery barn outlet in Memphis that seems to have your name written all over it. I did a google search and found nothing. That might mean it’s an outlet priced discontinue, it might be worth a call! 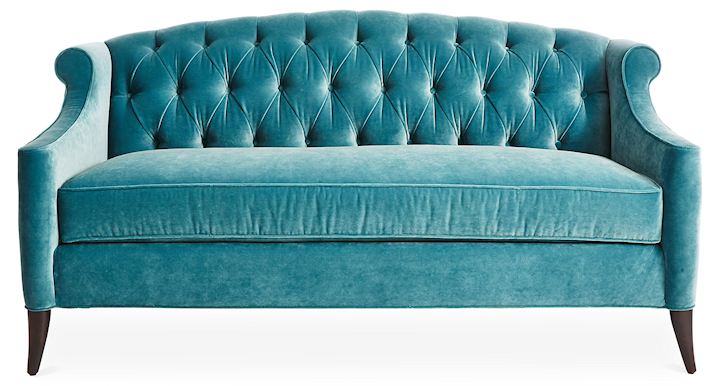 In my failed google search, I did run across this really gorg sofa though! I recently splurged and bought a leather chesterfield that is very similar, in a cognac brown. Put midnight blue velvet throw pillows on it to get a bit of the best of both worlds. Check out urban outfitters, their stores are kind of hip meets anthro, lots of velvet pieces to choose from. I personally wouldn’t spend more than 1 k only cause I know, I don’t want to keep a couch forever…. I’d rather buy another every few years. 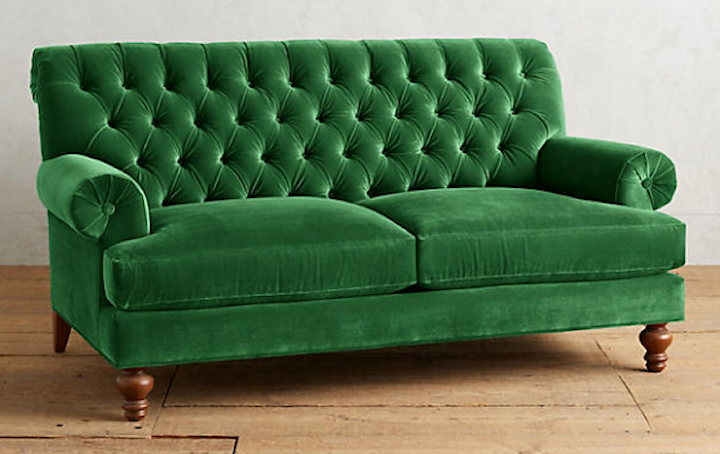 I like the Graham Velvet Sofa in Pine from Urban Outfitters. 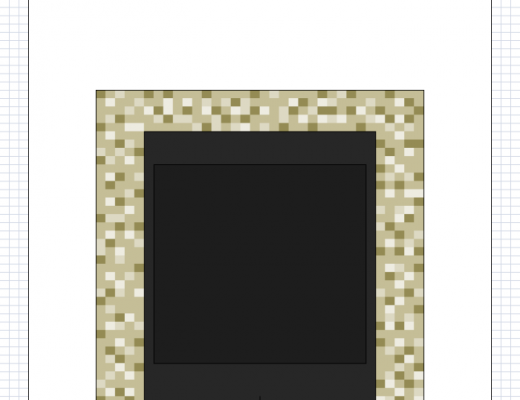 It actually looks like it might be comfortable unlike a lot of these with the really squared off sides. Some of these sofas look like they would be so uncomfortable. I once HAD to have a camel back sofa and it was a nightmare to sit on and get comfortable. The most uncomfortable would be the one with no arms. Look at INTERIOR DEFINE. They have beautiful sofas; you choose the fabric, style, length and legs. I ordered several of their Velvet Swatches; the colors are candy to the eye, and the velvet is incredibly rich in appearance. Kristi, I think I have mentioned this before, but why are you limiting yourself to only those retail priced sofa’s? I haven’t paid furniture store retail, or sale, prices for furniture in over 30 years. I’m talking North Carolina prices. You do not have to go to NC. Go to any of your local stores, yes, even those you know you can’t afford, and look, sit on, check fabrics, until you find what you want. There are a million places you can price check in NC that do business by phone (like when I first used them) and internet. If you have few stores in your area, it will probably pay to visit a larger area so you can look at a wider range of companies. There is a book, with a new 2016 edition, that I have used as a guide for years and have found invaluable. I’ll give the book name and info at the end of comments. Mark-up on furniture makes the mark up on cars, fine jewelry,etc. pale in comparison. This book gives the basic of how furniture buying works and facts regarding retail vs NC buying. AND…if its like previous editions gives a list of most of the places that deal directly with customers and lists the brands they carry and pros and cons of those outlets. A lot of the manufacturers no longer maintain their own outlets (so sad) but it will give those that do. I have bought sofa’s by this manner twice and saved much over any sale price I have found. Plus, I probably wouldn’t even have looked at a store carrying the brands I bought (Hickory Chair and Southwood). But I could using NC outlets and I picked out the style and my fabric of choice. You will pay shipping which varies upon your location. Considering what you save, and the unlimited choice you have, its well worth it. Being in Atlanta, I am lucky enough to be able to go to North Carolina, both Hickory and High Point and other locations within the area, and it can be mind boggling. For me, if I have it shipped or order via phone or internet, I pay no NC sales tax. If I pick it up while in NC, then their sales tax is applicable. By choosing your own fabric, you won’t be limited by the fabric and color the manufacturer thought would sell best. For choosing the fabric, trim etc. its best to go to a store that sells that product and look at the manufacturer’s fabric books. While you are there, get the local stores quote for the same sofa, fabric, trim that you intend to get. After all, they can custom order too. Just an IMHO, Southwood is one of the few manufacturer whose chairs or sofas I would order site unseen, or comfort tested in the case, I have a sofa by them and have tested others sofas and chairs by Southwood, including some styles that did not look very comfortable and have yet to find a style of theirs that was uncomfortable. As many as we tried from a lot of companies, this amazes me. With the money you can save on your sofa, you can do other things that may not have been in the budget. Oh, and they have lighting, accessories, rugs, etc. most anything for the home both indoor and outdoor. Here is the info on the book. Amazon has it. This is something worth buying in the print addition rather than the kindle addition. My older ones are full of notes, etc. I am “older”, and I have to say I have gone with color before, and even prints for living room furniture. I loved it on the showroom floor. Loved the idea of it. But the REALITY of the matter is.. IT WAS A NIGHTMARE to decorate around. What has been said many times is really THE TRUTH of the matter. Choose neutral colors for you big items, and bring in color with accessories. If had a huge home, and loads of money to decorate with, it might be different. But I never did. One must pull in the reigns and let practicality win. You will be happier in the end. Took me a long time to learn this lesson. I have dark green furniture now, and love it so much because it is so versatile. And again.. for practicality sake, go for comfort! I am 5’3 and my furniture is very comfy. You can find it. Why buy that beautiful pair of shoes that kill your feet, and why buy furniture that’s beautiful to the eye but you never want to sit on it because it kills you back?? Again, some have the money to have that lovely ‘sitting’ room that no one ever sits in, but is just for show. I have never been in that position. And frankly I am quite content to not have had it. I want comfort. I want to create a home that is comfortable for my quests. I want a home that oozes a hospitable vibe. Pleasant. Pleasing. Inviting. And… lovely. You might also consider joybird where you can choose your own upholstery for many different styles. Also they have a 20% off Black Friday sale right now. I really love your decorating style and am in LOVE with all the choices you’ve made so far…but I simply hate velvet couches. They seem uncomfortable, impractical, and…well, unsuitable for anything more than looking pretty. I’m certain you’ll find a way to make it work in your rooms, though, so I’m looking forward to seeing what your choose. I have two velvetish sofas, and love them. Had to talk my husband out of also getting velvet chairs! However, when you first mentioned valevet I immediately thought you’d love the Coco Tufted velvet from One Kings Lane. We fell in love with it last fall and finally, after looking all over discovered that we didn’t love anything else as much as that one and ordered it. It was better than we expected when it finally arrived and it is a perfect addition for our living room. 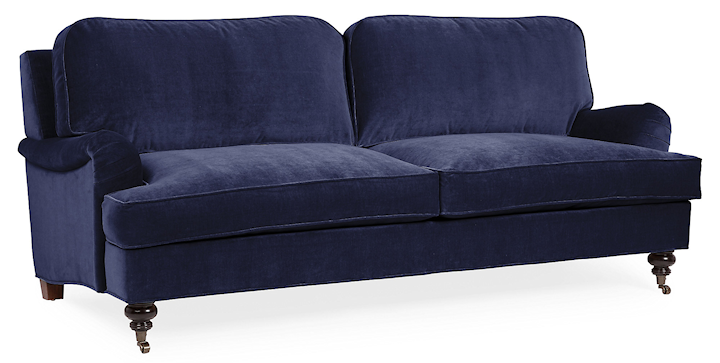 We bought our other velvet-ish sectional from La Z Boy – I think it is the Collins, with a durable navy blue fabric. It has been so comfortable and so practical for our family of 5 plus two dogs for TV watching in the den. We bought during a great sale last Thanksgiving and it delivered in February. I’ve followed you since I found your Roman Shade tutorial. I love the blues and teals, I think your new cabinet colors are gorgeous!! We’ve had amazing luck with Room & Board. They’re a higher price point, but offer some lower priced items and the customization options are amazing. Looks like they have some lovely velvet options in your palette AND they’ll send you samples. There’s also the possibility of scoring a deal at the R&B outlet, if you’re within driving range. They’ll ship/deliver from the outlet, too!